Irish Sea freight ferry specialist is to add capacity onto its busy Heysham Dublin daily service. The 105 trailer ‘Clipper Point’ will replace the smaller ‘Clipper Ranger’ adding annual capacity of over 25,000 extra spaces. The vessel switch will take place week commencing 10 Oct. The service upgrade for the Heysham Dublin service comes at a key point in the history of Heysham Port, just a few weeks ahead of the opening of the M6 link, on October 31, which will connect junction 34 of the M6 directly to the Port, completely bypassing the current bottleneck in Lancaster. As well as bringing speed, schedule reliability and additional capacity, the change confirms Seatruck’s long term commitment and strategic importance to the route. Other benefits from having the larger 105 unit vessel include, greater trailer free height and a faster turnaround time in port. The ship also benefits from a ramp interface to the lower hold instead of a lift. Drivers will appreciate the single berth cabins and the comfortable lounge area. The larger more powerful P series vessel will join her 2 sister vessels which already trade from Heysham on the Seatruck route connecting Heysham with Warrenpoint in Northern Ireland. The purpose built vessel ‘Clipper Point’ is no stranger to Heysham or the Irish Sea but in recent times has been on charter to other ferry operators throughout Europe. The deployment of larger vessel will attract more traffic to the route. Seatruck Ferries specialise in the shipment of unaccompanied freight trailers which is more efficient for the operators and makes better use of their HGV drivers which continue to be in short supply. Historically HGV freight to Ireland has predominantly moved through Scotland or Wales on a driver accompanied basis but the market is now shifting significantly. 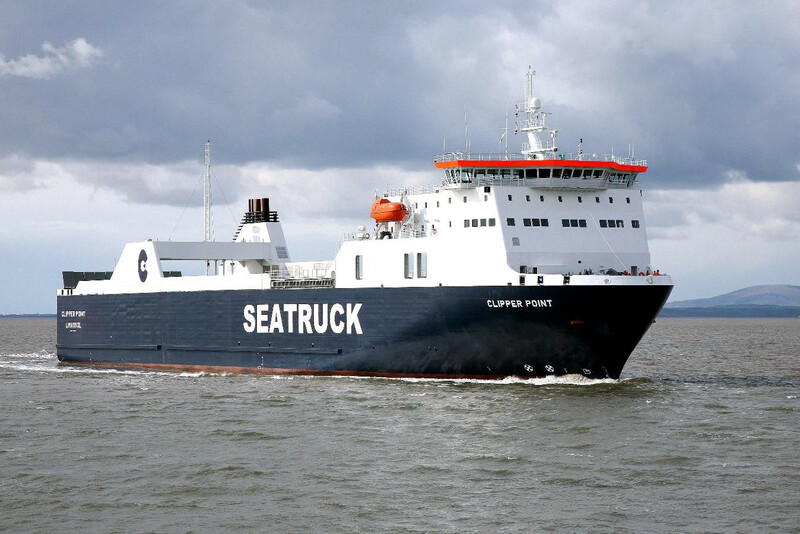 Seatruck currently operates 3 routes on the Irish Sea offering daily connections, including a service between Liverpool and Dublin. A new weekly service linking Dublin with Bristol also commenced recently. So far during 2016 Seatruck freight volumes have grown at roughly three times the market level. We have been planning for the opening of the M6 Link road for some time and it is absolutely no coincidence that we have chosen to upgrade our service offering from Heysham at this time. The Clipper Point was purpose built for Heysham by Seatruck in 2008 and we look forward to welcoming her home to help with our continued growth in the Port of Heysham. 20 years after the first Seatruck sailing we are just as hungry for growth, having just as much fun and still firmly believe that our business model is the correct one. This is just the next step in the Seatruck story.